October is a busy month for Alpina as the German performance company is preparing to facelift its version of BMW’s flagship 7 Series sedan. New photos also reveal Alpina is in hurry to put its hands on the fresh X7 SUV and to make it even more powerful. The Bavarian automaker hasn't confirmed its plans for a performance X7 M, but Alpina wants to make the diesel-powered variant more potent. This slightly camouflaged prototype uses a 3.0-liter inline-six quad-turbo diesel engine under the hood, sourced from the most powerful diesel X7 to date, the X7 M50d. In its standard application, the motor is good for 394 horsepower (294 kilowatts) and 560 pound-feet (760 Newton-meters) of torque, but sources tell us Alpina will boost that figure by at least 50 hp (37 kW). 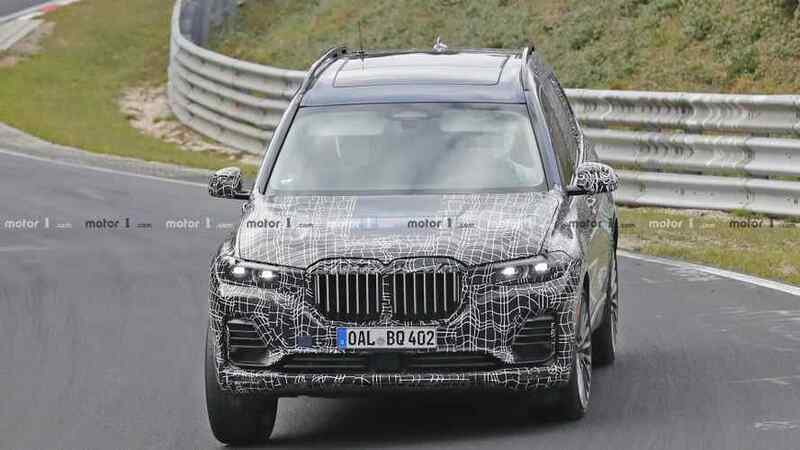 This will make the future XD7 (name unconfirmed) the most powerful production SUV in the world, a title that currently belongs to the Audi SQ7 TDI with 435 hp (320 kW) and 664 lb-ft (900 Nm). Sorry, Bentayga Diesel. In case you are wondering what makes this prototype an Alpina rather than a BMW, it’s the license plates that tell the secret. The OAL lettering refers to the Ostallgäu district of Bavaria, Germany, where Alpina’s headquarters is located. We could be wrong, but some of these photos suggest the performance SUV features a rear steering system. If you take a closer look, it seems that the rear wheels are turning in the same direction as the front ones, which is basically what such systems do at higher speeds. The shots also hint at a sportier suspension setup as body roll appears minimal. It’s probably too early to talk about a debut date for the Alpina-tuned diesel X7, but different sources claim this should happen in the second half of next year.